Some personal realizations occur when sitting under a red-tinted hood of heat and wearing enough foils to make contact with an alien mothership. Sure, you can get six weeks of color before growing roots plant you back in that salon chair; but you can also end up with brassy zebra stripes that bring back memories of ultra-glossy Lip Smackers and frosted cream eye shadow. (The early 2000s called, and they want those platinum blonde stripes back.) Thankfully, traditional foil highlights are no longer the only go-to hair color choice. Now, game-changing hair coloring techniques, most namely balayage highlights, let us get the hair of our wildest dreams: natural-looking, low-maintenance, and endless in options. Balayage technically means “to sweep” or “to paint” in French, but in our opinion, it might as well mean to look beautiful, natural, and enviously kissed by the sun. We can’t help but drool over rich chocolate brown brushed with melted caramel and honey and swoon over golden blonde touched with smooth butter and amber. These dynamic color blends are achieved by free-hand painting hair with lighter shades, which catch light perfectly and look like the natural highlights from the summers of your youth. The strokes are artfully placed all over the head, but often frame the face and coat the ends most prominently; and they grow out most flatteringly, making touch-ups fewer and far between. If you want to liven up your locks for spring and summer, it might just be time for a hair color pick-me-up á la balayage. No matter your hair color or style, we have the balayage hair color inspiration you need to take to your next salon appointment. This balayage looks like someone poured the perfect caramel color onto warm chestnut hair for a light-catching effect all over. You see the dark brown mixed in throughout, resulting in a super dynamic head of hair! This combination of shades gives that perfect sun-kissed, beachy look that everyone loves, but it’s usually seen in pure gradient ombré form. This more blended balayage makes it look natural and frames the face nicely. Rose gold looks amazing on warm brown shades, and this lob-length cut uses it for heavy face-framing to bring light and interest up front. We’re thinking this is the shade to try this year. This bold, highly pigmented red really gets a flash of personality (like it needs any more!) from caramel-honey balayage. The tones in the warm caramel and honey shades blend with the red shade for a cohesive look. We’re not sure we’ve ever seen such buttery blonde goodness as this silky, one-length lob haircut. Golden honey and bright butter blondes are perfectly blended together throughout. Create a delicious blend of dark chocolate, mahogany, chestnut, and cinnamon for a look that’s dynamic and rich in color. You’ll be tossing this mane around to witness the layers of warm color. This base color has a hint of warmth to it, making honey the best blonde shade to enhance the natural tone. This honey shade is used to frame the face and is peppered throughout the rest of the head for cohesiveness. This red-brown base of chestnut gets even more lively and bold with rich auburn balayage that looks richly sun-kissed for a dark color. This unique blend won’t work on everyone, but man do we wish! 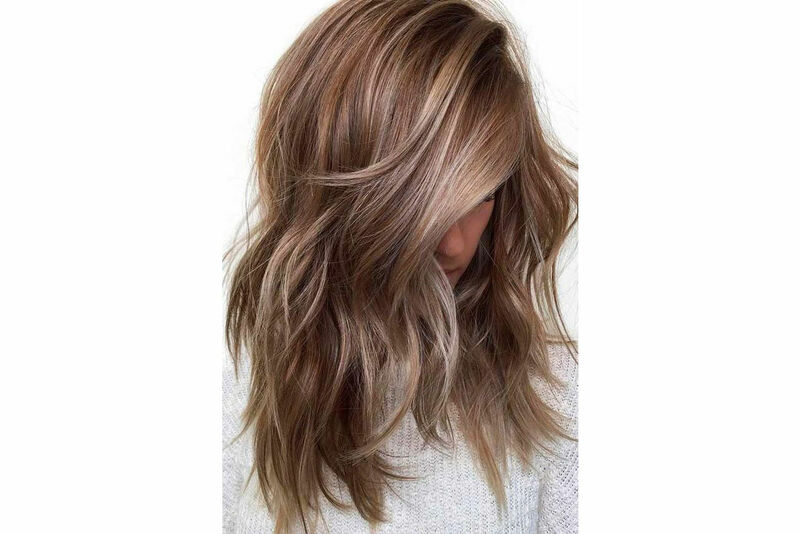 Although balayage is often more sweeping in color, these thin strokes allow for a lighter blonde-caramel shade to be used on dark brown hair. It looks perfectly sun-kissed. These locks look spun out of gold and give major Rapunzel feels. Different shades of light blonde are blended together in smooth strokes. These bouncy curls get so much more definition and movement from subtly blended auburn balayage. Long, curly hair can look weighed down, but adding light-catching color makes all the difference! Though a little more outgoing than most, this balayage look is mesmerizing with its dynamic color placement and vivid shade selection. Each strand seems to feature more than two colors, making it a blended dream! This lob haircut blends cool ashy shades, starting with dark ashy brown and going all the way to light beige ashy blonde. It captures the ombré style without going too stark. Tortoiseshell color captures the rich combination of dark brown, chestnut, caramel, and honey to create a full-bodied look. This lob-length cut brings out the caramel and honey more than some tortoiseshell looks, and we’re loving it! 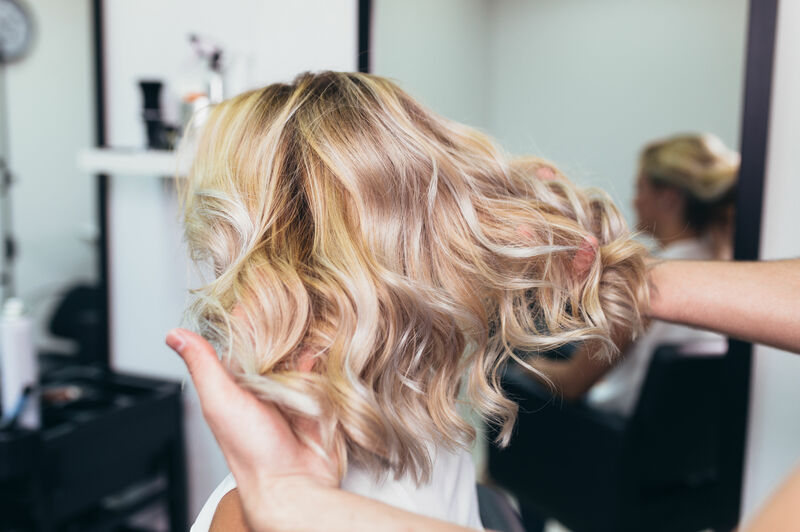 Lived-in color is the recent trend that uses an intricate system of balayage, incorporating both lighter and darker shades from the base color to create a blend that looks so natural that you only have to head in for touch-ups every six months. This subtle look starts with its dark brown base color and enhances it with chestnut strokes on top and around the face. Liven up a short cut with face-framing blonde sweeps of color on the bangs. This neutral dirty blonde gets some freshness from a honey blonde. A light balayage treatment gives a subtle punch of interest to this rich brown bob. It’s just enough color to keep things fun and interesting. Heavy balayage gives a chic finishing touch to this choppy medium-length haircut. It’s warm and bright to make this fine hair pop. Natural, imperfect pieces of ashy and icy blondes are swept throughout this light ashy brown, layered haircut. Ashy bronde is one of the hottest hair trends this year, and this look shows why! This trend is about taking a dark chocolate cherry or cola brown hair color and infusing it with a deep auburn or cherry red shades to create a fun style. Sometimes it looks more brown, sometimes it looks more red—it’s all about the lighting! This head of strawberry blonde locks gets enhanced with some lighter blonde balayage. The hair is full of the warm undertones, but the ends glow with a bit of extra blonde fun. The strokes are kept random and natural in this brown bob, giving just enough fun pops of lighter caramel to keep it interesting. This most subtle balayage blends light chestnut with its warm tones into classic dark chocolate brown hair. It keeps hair from looking flat and dull, but doesn’t make a huge statement. Although the cream soda blonde shade already features warm golden and honey tones, this style ramps up that warmth with some more rose gold blended throughout for a cohesively eye-catching color. This style creates a perfect gradient of red and copper shades for an ombré balayage that looks fresh and vivid. The deep red on top anchors the hair, while the light coppery ends make it interesting. This cascading raven-black hair gets a needed boost of shine and color from red-brown balayage swept around the face and bled down onto the ends. 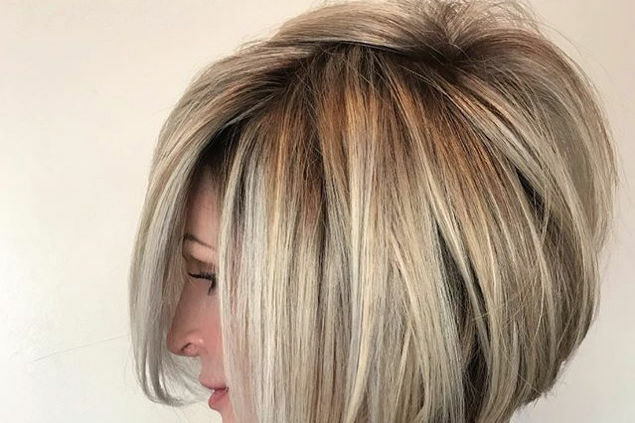 This head of cool-toned ashy blonde strays from just sticking with its own tone by weaving in subtle buttery blonde balayage with icier light blonde. This neutral blonde gets a little pick-me-up from face-framing golden touches that stretch into the ends of the hair. The golden shade isn’t too yellow or warm, making it perfect for the beige blonde color. The sweeping caramel color is taken from mid-shaft to the ends of the hair in a gradual ombré fashion. Balayage is meant to be subtle, making this soft ombré a great choice. Get the perfect warm blonde blend with cream soda, which takes golden and light amber tones to create an entirely new blonde shade. This mix of amber blonde, caramel brown, and hint of dark ashy brown makes for a lively and bright light brown hairstyle to rock this spring and summer. This stacked bob uses rich brown with rose gold and caramel balayage to give a summery tone we can’t get enough of. It looks amazing on tan or olive skin too! Cool black shades pair well with ashy tones, whether brown or blonde; and this style looks naturally lightened going from roots to tips.